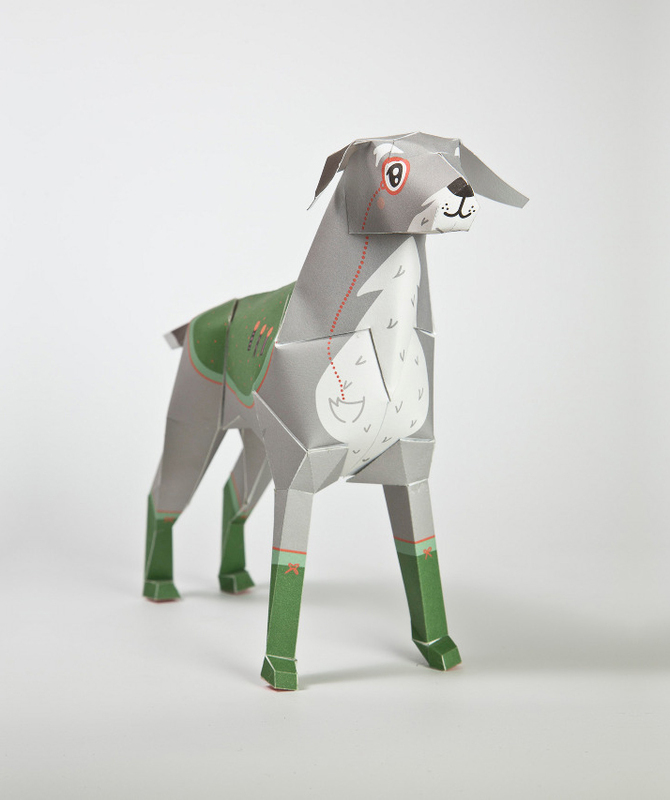 Gerald is a paper dog and was born as part of a rebrand for British design studio, Lazerian. Established by Liam Hopkins, the studio works to develop innovative solutions in furniture, lighting, interiors and products by working in materials which are often overlooked. This has included affordable plywood, cardboard and paper. Lazerian’s contribution to the pantheon of classic design, Gerald was the result of a collaborative project between Hopkins and fellow 3D designer Richard Sweeney. 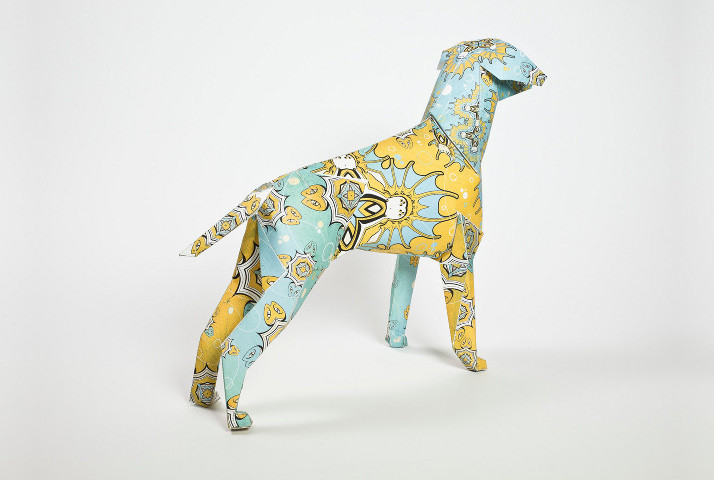 The two worked on the outline of the dog on paper, developing a flattened pattern before printing out the components and hand cutting, folding and gluing them until they reached a stage that they hit on a pattern that could be easily reproduced. 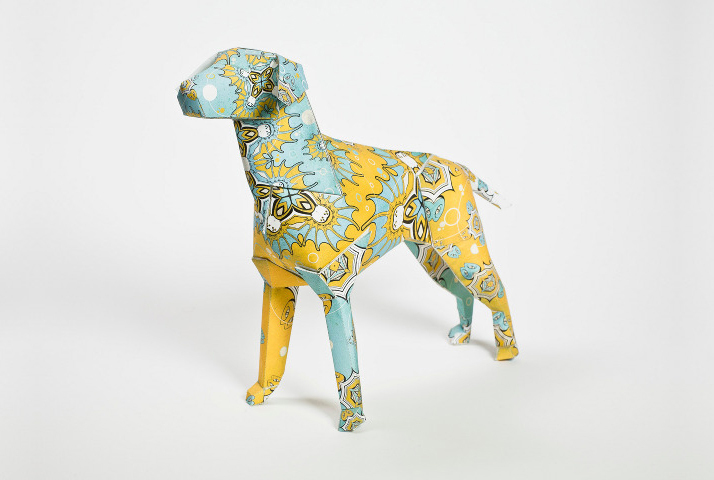 By 2009 Lazerian held the blueprint for a free standing paper dog that anyone could make at home with a sharp knife, glue and a healthy degree of patience. 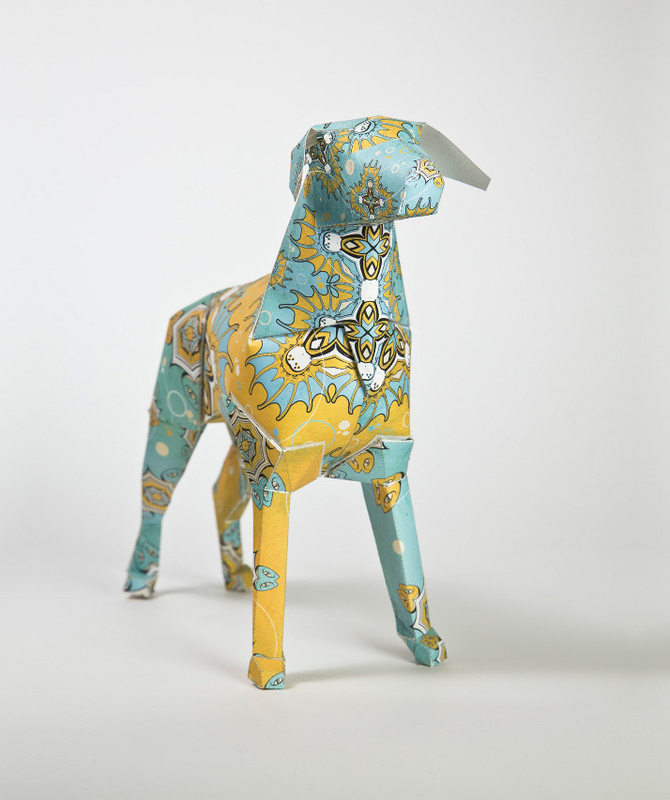 The small dog came as just nine easy to assemble paper panels, with the larger versions made by the studio taking 88 components to be able to stand. Gerald was first launched at the 100% Design event in London, with Lazerian taking a stock of flat packed patterns to sell. He was a total sell out, with every Gerald going to a new home on the first day. 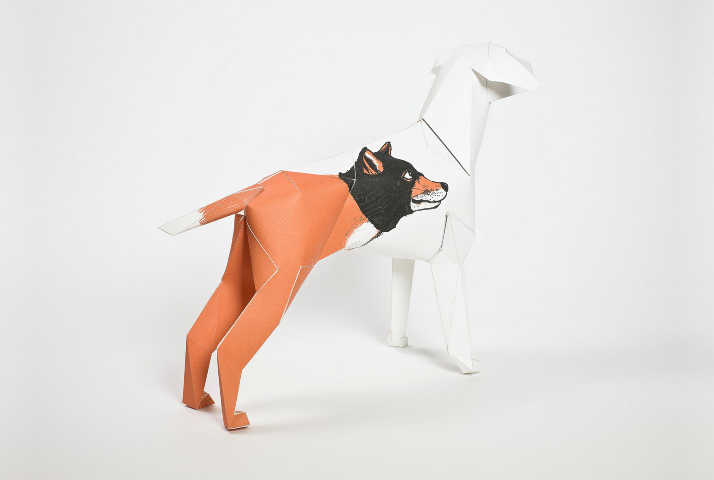 After attaining perfection in Gerald’s design, Richard and Liam set about making their own distinctive versions of the dog, having fun with Gerald as a blank canvas. 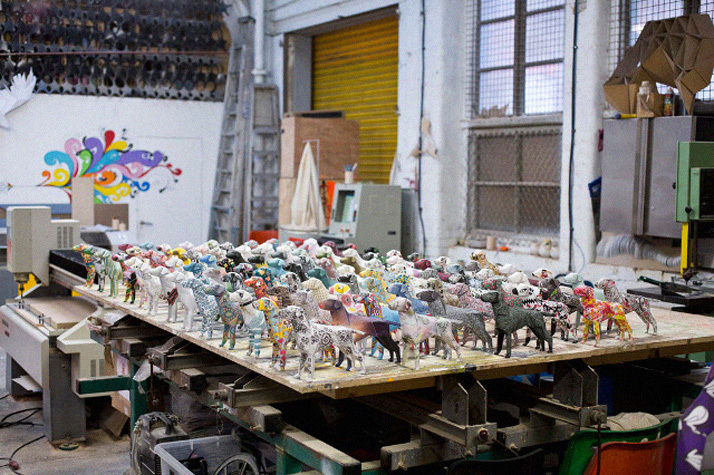 Between them, they produced the first customised Geralds, Dazzle and Pixel. Dazzle was ice cool with a monochromatic stripe and Pixel cute with a pastel colour pattern on each flat panel. 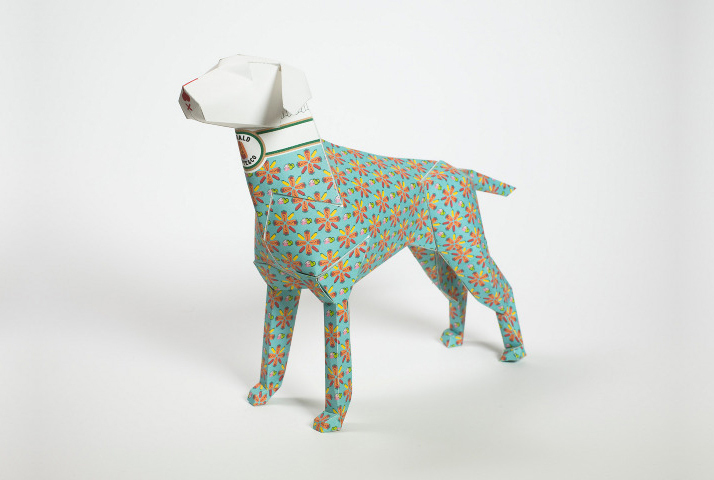 The success of these individual dogs gave rise to the Gerald Project and the first dogs started being shipped to many of Hopkins’ favourite artists, designers and illustrators from early 2011. In 2013 they all came home, individually marked by some of the world’s finest image makers. Gerald’s outline is directly inspired by the Bracco Italiano, a handsome gun dog that is known for its devotion to its master. It was chosen as a mascot for Lazerian to evoke the same spirit of loyalty, affection and heritage that the design house instils in every project, brief and collaboration.